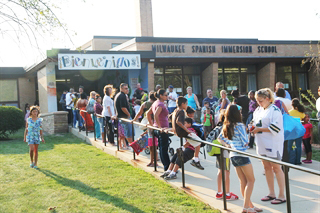 • Approved a new second site to expand MPS’ successful Milwaukee Spanish Immersion School; the move addresses strong interest in the program, which has a waiting list, and reopens a currently unused school building. Starting in fall 2016, MSIS’ early childhood grades (K4, K5, 1st) will be located in the former 88th Street School, 3575 S. 88th Street, Milwaukee 53228; and the older grades (2nd-5th) will remain at the current 55th Street site. • Approved creating a strong standalone gifted and talented middle school program by moving the middle school from Morse Marshall School for the Gifted and Talented to the former Burroughs site at 6700 N. 80th Street, Milwaukee 53223, effective fall 2016. The middle school will feature SpringBoard pre-Advanced Placement curriculum. Moving the mid- dle school program provides room for it to grow and space for the high school, which will remain at 4141 N. 64th Street, Milwaukee 53216, to grow as well. • Approved transition- ing Victory School to a full Italian immersion pro- gram beginning with K4 in fall 2016. The change means immersion students will learn their core subjects such as math, science and social stud- ies in Italian as is the practice at MPS’ French, German and Spanish immersion schools. The Italian immersion program at the school, 2222 W. Henry Avenue, Milwaukee 53221, will provide citywide transportation effective fall 2016 as well, matching what is offered at MPS’ other immersion schools. • Approved a new partnership between Pulaski High School and Carmen High School of Science and Technology-South Campus, bringing the two schools together in one building to improve student achievement, school environment and teaching and administrative practices. The partnership at the Pulaski Campus comes as the district continues to embrace the urgent need to improve student outcomes, particularly at the high school level. In other action, the Board also approved a lower tax levy for 2015, with the overall levy decreasing by about 0.5 percent compared to 2014. The levy continues to include a unique burden for Milwaukee taxpayers: the state requires Milwaukee Public Schools to fund a portion of the cost of school vouchers even though the state does not allow MPS to count those students for aid purposes. This situation compels MPS to levy additional taxes to cover the cost, which for 2015 makes up 17 percent of MPS’ tax levy. A phase-out approved by lawmakers has already begun, but Milwaukee taxpayers will wait more than a decade for the funding flaw to disappear under the plan. The slightly lower levy will leave the tax rate largely unchanged. Initial estimates show the owner of an average home – valued at $98,935 – would pay about $18 more in school taxes compared to last year.